Denne boken har håndtegnede motiver av artist David van der Poel. Han er 25 år og bor i Tromsø. Motivene er fra arkiske strøk og du finner bl. a. gaupe, ulv, rein, elg, røyskatt, oter, flere fiskeslag, flere plantearter, nordlys m.m. Denne boken er tiltenkt turister eller andre som vil kjøpe en unik gave som souvenir fra Norge. Fargeleggingsbøker produsert i Norge, av norske kunstnere med norske motiver finnes det ikke mange av. 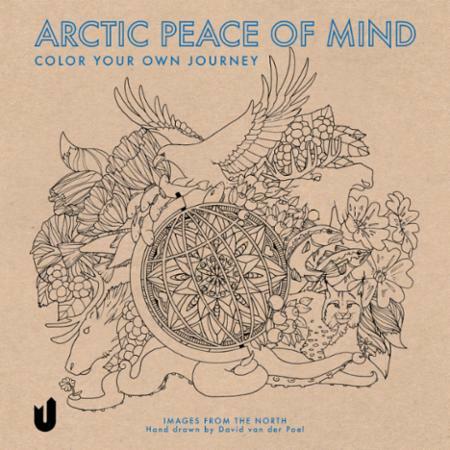 Arctic Peace of Mind har høy kvalitet i alle ledd. The Arctic, or the Circumpolar North, is the area to the north of the northern polar circle, i.e. north of 66° 33'N. There are eight countries whose territories extend into this circle including the United States, Canada, Denmark (via Greenland), Iceland, Norway, Sweden, Finland, and Russia. 14 million square kilometers (5 million square miles) is land. This book contains a small selection of motifs inspired by this region, which can be cold and arid and at times covered with ice and snow, but at the same time teeming with life and colors in the most unexpected places. It is our hope that this book will bring you joy, serenity and peace of mind. We have also created short titles in Norwegian, English and Latin, in order for you to explore more information if you want to. Some of these species also exist south of the Arctic circle. As the climate changes rapidly, so do the living conditions for both animals, plants and man. David van der Poel has used his artistic license to interpret animals, plants and natural phenomena, and in the same way you are free to use the colors you want. He has drawn everything by hand. No shortcuts have been taken. This is a book to take back your time.